board ready to be framed. 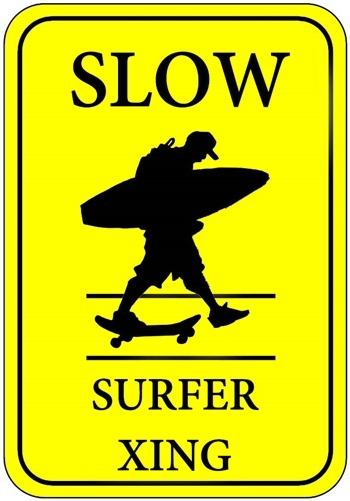 This Surfer Crossing Sign features a yellow background to warn cars to slow down when you are crossing the street to go for a surf. 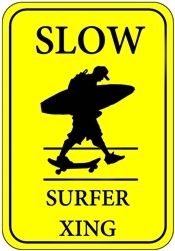 Fun reproduction of a street warning sign, shows you a packed up skater heading to the beach. This surfing sign is hand drawn and printed on a thick poster board ready to be framed. This surfing sign will make a great accent to any room in your home, or to highlight your surf bedding. These fun retro surfing signs are 11" x 14" and will look great on any surfer's wall! Not really made for outdoors, unless you put an outdoor weather resistant frame around it. Click image for a more detailed view of this surfing sign. Each surfer crossing poster board sign is only $19.99, If you have any questions or concerns, please remember you can always phone us at (949) 370 - 6535 or chat online with one of our customer service reps.